Manufacturer of a wide range of products which include shoulder anchor shoulder arthroscopy instruments and low-profile cancellous screws & spiked washers. Arthroscopy is defined as the examination of the interior of a joint and is also called arthro endoscopy. this also involves treatment of upper and lower extremity injuries including arthroscopy of the knee, ankle, shoulder, elbow, and carpal tunnel. 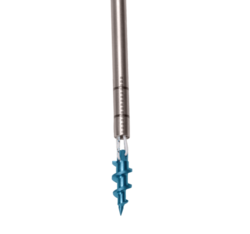 new product innovation in arthroscopic surgery is the heart and soul of biotek, which has resulted in the development of wide range of products for arthroscopic and minimally invasive orthopedic surgical procedures. our goal is to make technically demanding surgical procedures easier, safer and reproducible. post screw for the procedure of suture or soft tissue fixation.